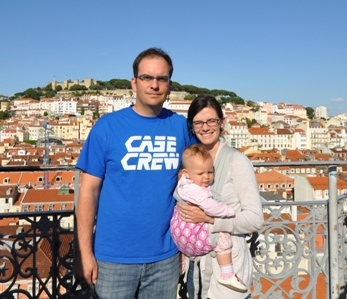 Erynn and I took her little brother, Caleb, to Lisbon for a short weekend break. 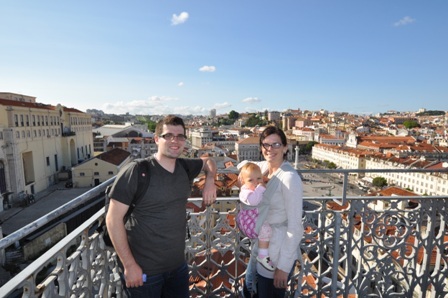 Caleb is fluent in Portuguese and so we took the opportunity to see the city with a native speaker. 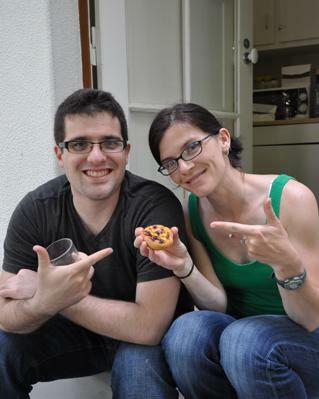 This was part of his summer staying with us in Germany and we al had a great time. 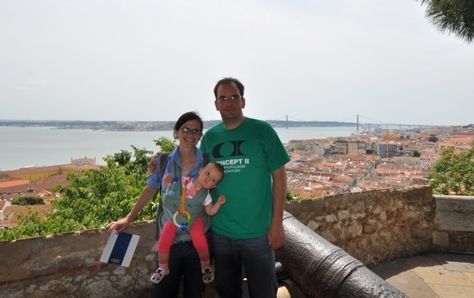 For full resolution photos from the trip to Lisbon (Lisboa) click here. 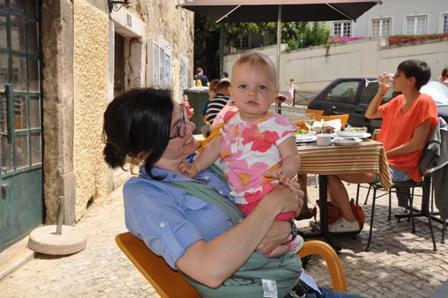 Traveling with Greta is becoming slightly more difficult as she gets nearer to one year old. 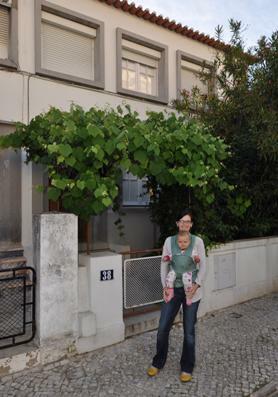 So Erynn found a great web site, rent4days.com where she found a nice rental house just outside of the city centre. It had three bedrooms and was pretty reasonable, plus if the baby cried she wouldn't keep an entire hotel awake. 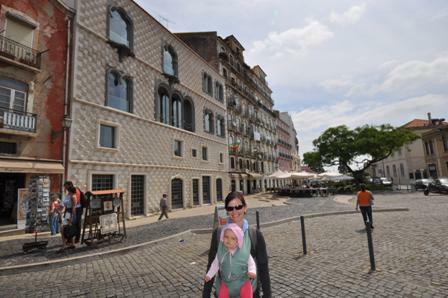 The house was a short, less than 5 Euro, cab ride to the main sites in the city center. You can see more photos from the house here, but it was perfect for a few days. It included a kitchen and a nice back patio where we enjoyed way too many custard cakes. Words can't describe how good these little beauties were. We each had two each day we were there, and there was a little shop less than 5 minutes away. If we got there right at the correct time they were still warm too. Oh my goodness! 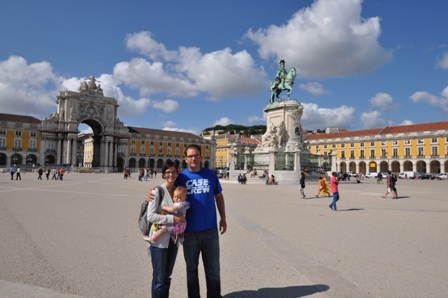 After getting settled into the house we headed straight for the city center and the Praça do Comércio. 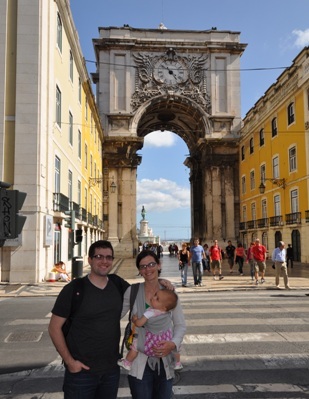 The taxi driver dropped us off right at the Arco da Vitória, which then led into the huge square on the waterfront. The weather was beautiful and the square was impressive. 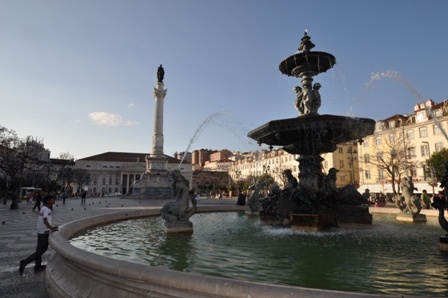 Here's a nice wide angle shot of the Praça do Comércio. 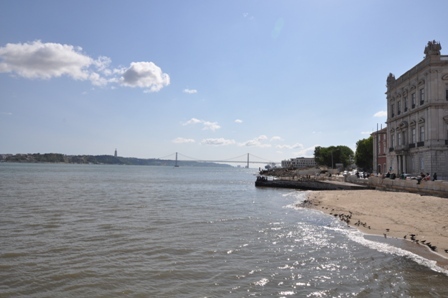 The square opens up onto the Rio Tejo (left photo) where you can also see the de Abril Bridge that looks exactly like the Golden Gate Bridge. 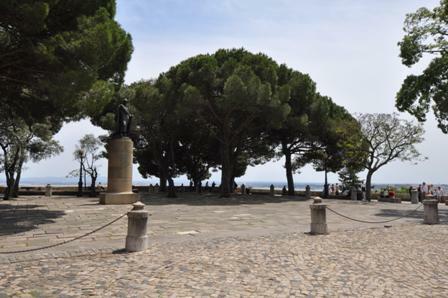 Also in the far distance is a huge statue of Jesus looking over the city. 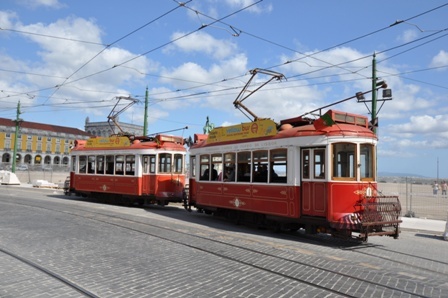 In the right photo is one of the many tourist trams packed with tourists. 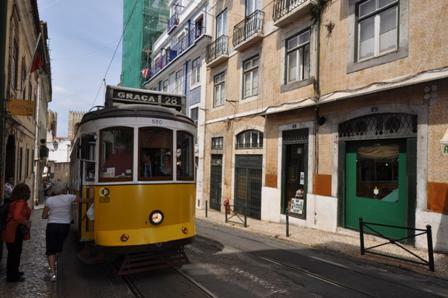 Especially Tram 28, which takes you up to the castle -- more on that later. 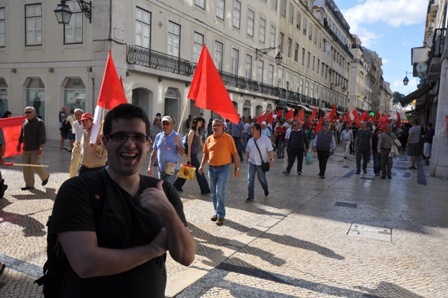 So if you're Portuguese and not happy with the current state of the government and economy you embrace Communism. Or at least this small portion of the population. 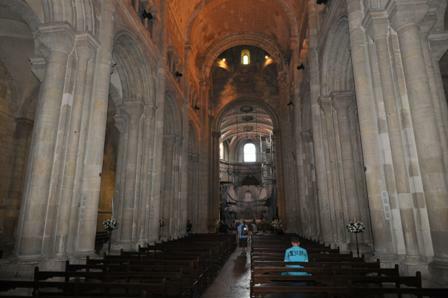 On Caleb's first major excursion to Europe he found this fascinating. 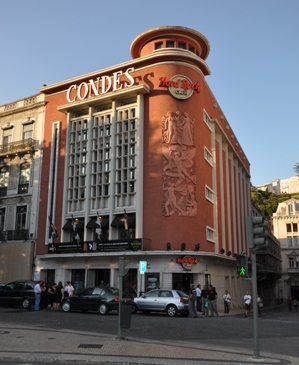 The group was marching down the Rua Augusta, which is one of the main pedestrian thoroughfares in the city. 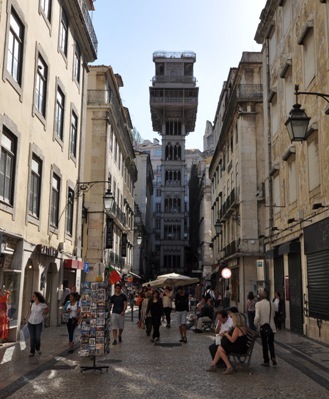 Just off the Rua Augusta is the Santa Justa Elevator, which affords some great views of the city and a nice way to avoid walking up the big hill. 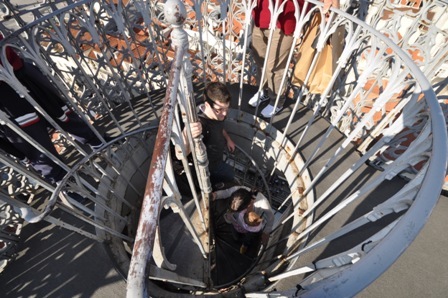 The elevator is well over 100 years old and designed by the same company that did the Eifel Tower. So it was safe, but we still tread carefully. 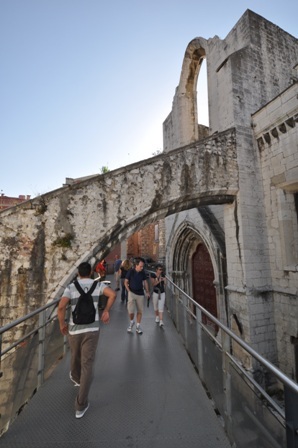 At the top of the Santa Justa Elevator is a bridge over to the Convento do Carmo. 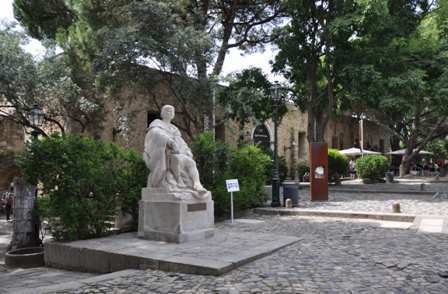 There was a nice square and archeological museum and some government buildings. We were mostly interested in finding a quick dinner, but not before Erynn stopped at a cool t-shirt shop. 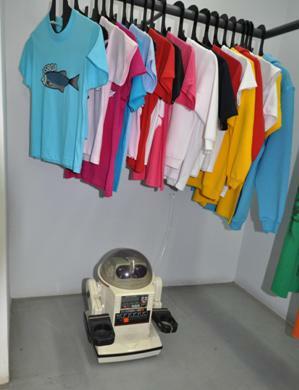 Erynn's family had one of these robots, which we saw at the t-shirt shop. We then tried to stop at a place (O Adriano) for a quick dinner, but even with our fluent Caleb couldn't get the waiter to serve us. So we left. Don't eat there. 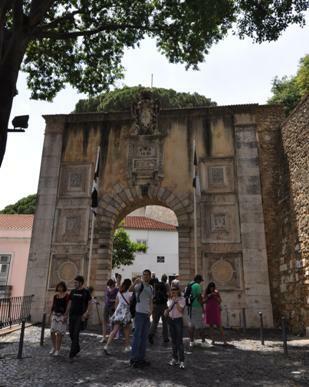 The next morning we headed up to the Castelo de São Jorge. Instead of taking the Tram 28 up to the top like almost everyone else we decided to take our time and walk. As you can see from the photos the day was beautiful and we made a bunch of stops along the way. 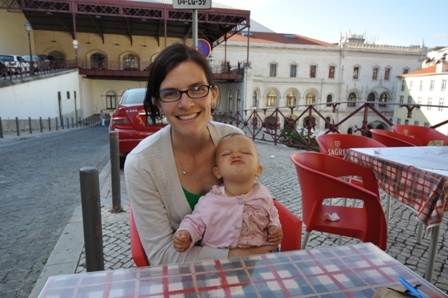 Greta likes to sleep in so pretty soon into our walk we stopped for lunch at a great little cafe - Canto da Vila. 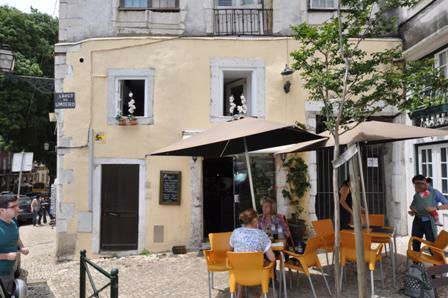 Along the way there were many patios afforded great views of the city and waterfront. 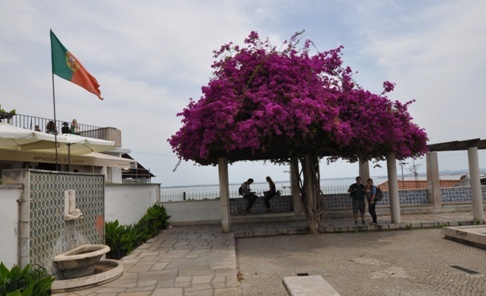 The left photo is the Miradouro Santa Luzia and the right photo is the Miradouro das Portas do Sol. 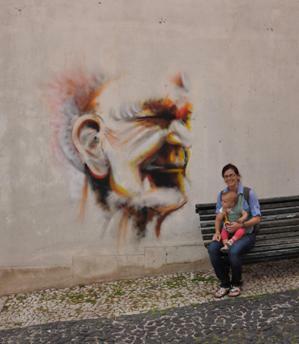 Then quite a hike up the hill and past the turn off to the castle is the Miradouro Sophia de Mello Breyner Andresen. As you can see it was an amazing view though it was quite steep the last couple hundred meters. 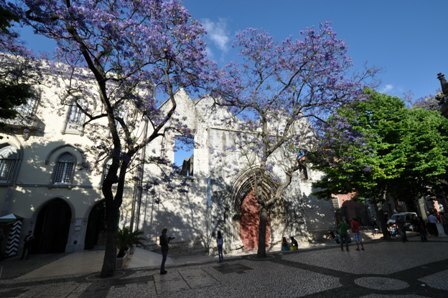 Next up was the Castelo de São Jorge. 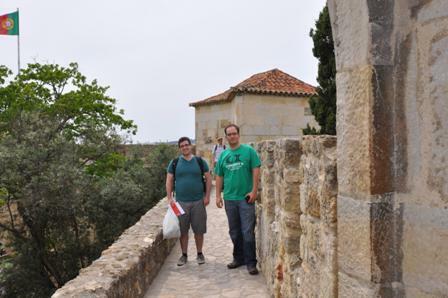 The castle occupies a citadel overlooking the city and now it's also a museum. The left photo shows the main visitor entrance, and around to the right is where you buy the tickets. 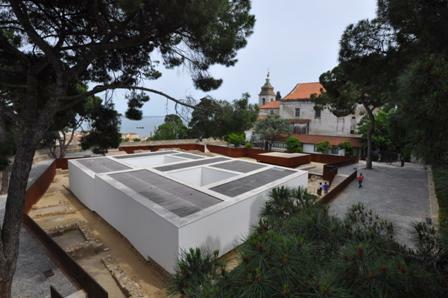 The right photo shows the Castelo Museum. After securing a ticket and going through the entrance turnstiles, you come upon a wonderful courtyard and vista of the city. 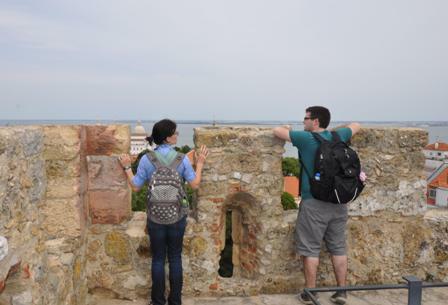 We then spent a while exploring the fortification, which was interesting because you could climb all over the walls and view the city. Last up in the Castello was the Archeological Site, which wasn't too terribly interesting other than there weren't many people there. 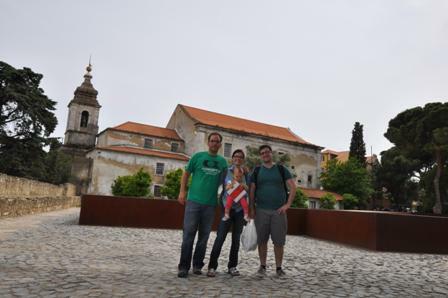 This lack of people allowed us to set up the camera for our only group photo of the trip. We decided to start heading back down the hill and go home -- timed perfectly for Greta's bed time. 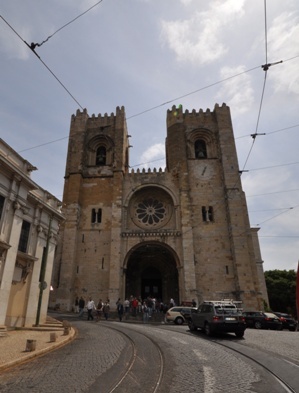 On the way up we stopped briefly at the Lisbon Cathedral, but there was a service in progress so we didn't stick around. However, by the end of the day it had cleared out and we were able to go in and snap some photos. 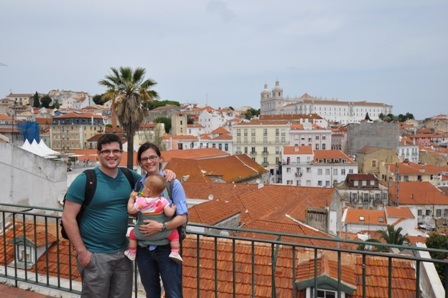 And so ended our wonderful, short, little trip to Lisboa. We lucked out with the weather, and with Greta in tow didn't push too hard to see more. 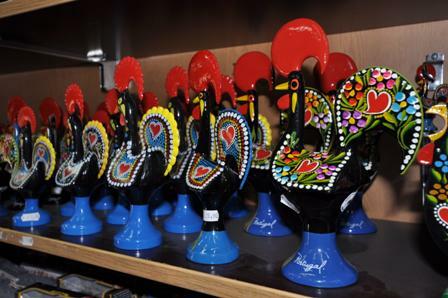 The whole weekend I was on a quest to find a ceramic Portuguese chicken with the word "Portugal" written on it. 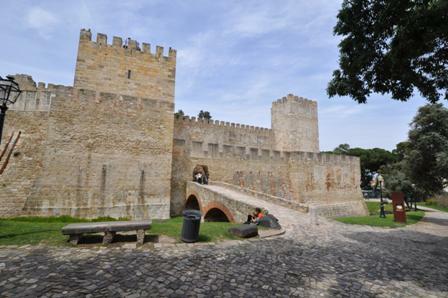 We must have stopped in 10 different tourist shops without luck until the shop right at the entrance to the Castelo. I somehow found this odd that the most tourist spot of all tourist spots was the one place without the advertising on the chicken. I also threw in this wonderful graffiti picture. Talent.